Self-Confidence is a learned skill. 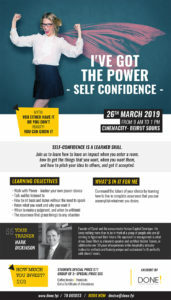 Join us on the 26th of March from 9 am till 1 pm at Cinemacity – Beirut Souks to learn how to have an impact when you enter a room, how to get the things you want when you want them, and how to pitch your idea to others, and get it accepted. Gather up your friends and colleagues for a special group price! Book your seats now! © 2019 DONE! , All rights reserved.